Localization of PIESP1 and PIESP2 with specific antibodies. (A) Immunofluorescent microscopy of PIEs (P. falciparum strain 3D7) fixed onto glass slides. Glass slide were incubated with anti-PIESP1 (Plates a and b), anti-PIESP2 (Plates c and d), and pooled preimmune sera (Plates e and f). Fluorescent images (Plates a, c, and e) and phase-contrast images (Plates b, d, and f) were collected simultaneously on an Olympus BX-60. 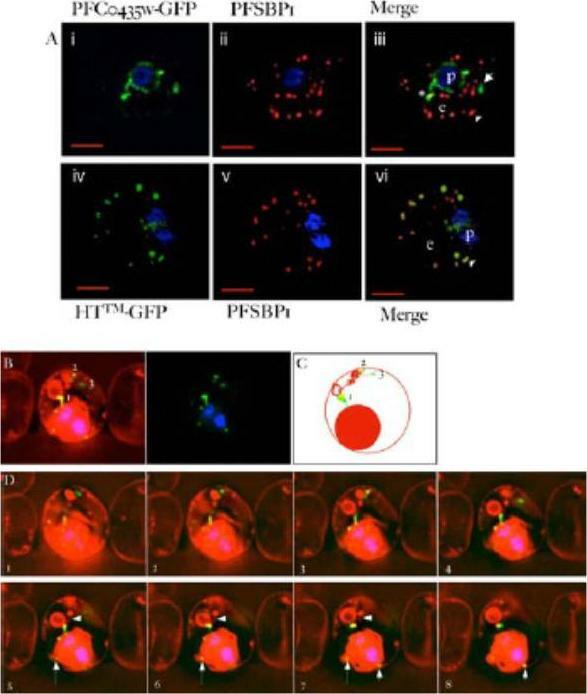 (B) Localization of PIESPs with immunofluorescent confocal microscopy. 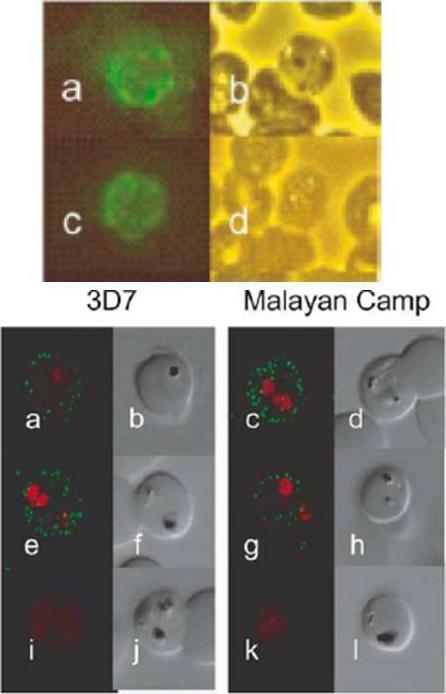 Live P. falciparum strains 3D7 and Malayan Camp (unselected for knob and rosetting phenotypes) were incubated in suspension with specified antibodies. Plates a–d, anti-PIESP1 as primary antibody; Plates e–h, anti-PIESP2 as primary antibody; Plates i–l, preimmune sera as primary antibody. The 488 and 568 nm laser channels, for Alexa Fluor 488 and ethidine bromide, respectively, were collected separately and later superimposed (Plates a, c, e, g, i, and k). The DIC images (Plates b, d, f, h, j, and l) were collected simultaneously using the transmitted light detector. 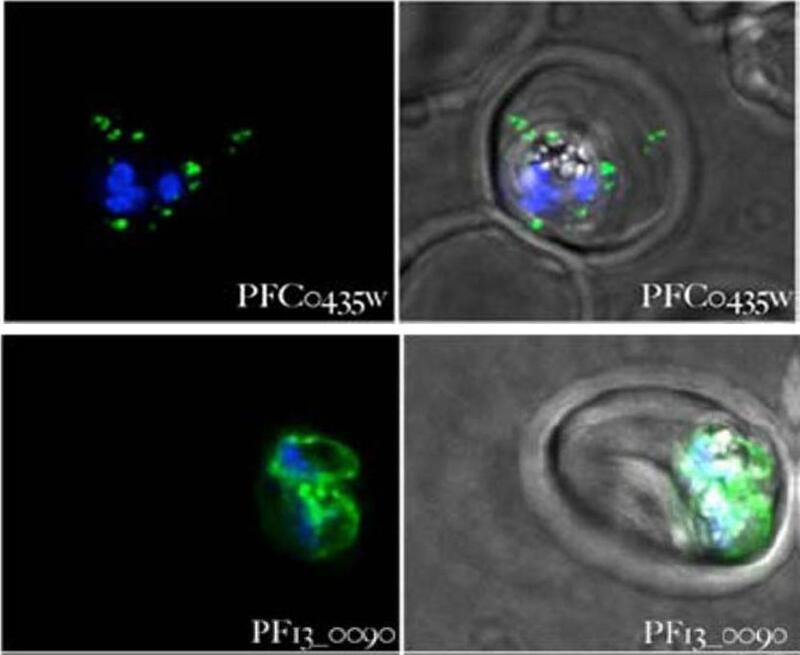 Florens L, Liu X, Wang Y, Yang S, Schwartz O, Peglar M, Carucci DJ, Yates JR 3rd, Wub Y. Proteomics approach reveals novel proteins on the surface of malaria-infected erythrocytes. Mol Biochem Parasitol. 2004 135:1-11. Copyright Elsevier 2010. 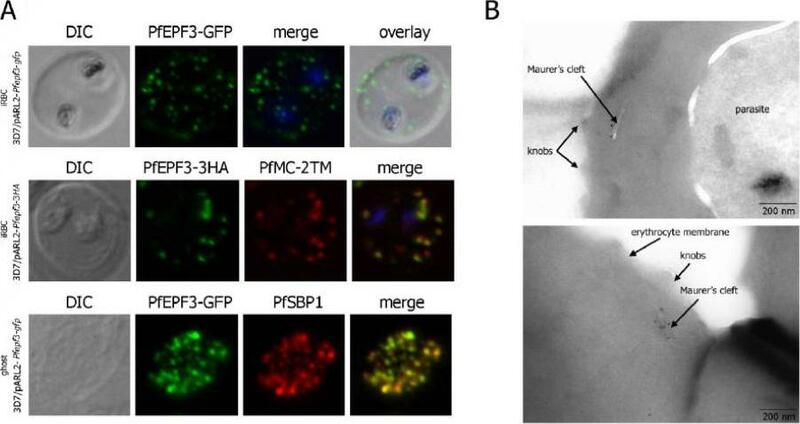 Localization and topology of the PfEPF3 proteins. A. Fluorescent patterns of iRBCs infected by 3D7/pARL2-Pfepf3-gfp (live imaging) and 3D7/pARL2-Pfepf3-3HA (immunodetection using anti-HA antibodies, in green, and anti-PfMC-2TM antibodies, in red) and of resealed ghosts from 3D7/pARL2-Pfepf3-gfp iRBCs (GFP fluorescence, in green, and immunodetection using anti-SBP1 antibodies, in red). RBCs and ghost preparations were incubated with DAPI for nucleus labelling. B. Immunoelectron microscopy using anti-GFP antibodies.Mbengue A, Audiger N, Vialla E, Dubremetz JF, Braun-Breton C. Novel Plasmodium falciparum Maurer's clefts protein families implicated in the release of infectious merozoites. Mol Microbiol. 2013 88(2):425-42 PMID: .